Capacity planning is the most useful feature. One of its flaws is with reporting. Complete product is valuable to me, but the best of its features is that it monitors VM from vCenter or ESXI perspective. This means it is collecting data from vCenter/ESXI, and when you virtualize servers it should be monitored from Hyper-V for performance and not from what we are seeing inside the VM (when doing performance diagnostics it should come in last). Another feature is the dynamic threshold, where its’ algorithm defines it over a certain period of time. One of the features is capacity planning and it is most useful for me. It helps to correct sizing of VM. It shows which VMs are over-provisioned and undersized. You can then increase you VM density on the ESXI. I think, one of flaws is in its reporting, in that you can’t search, export or manipulate metrics relating to VM IOPS in a useful way, (version 5.6). VMware has revisited its product VCOPs and launched under the name vRealize Operations Manager, vRO. I still need to explore this product. It is a pretty stable product, but when it is integrated with a vSphere client sometimes I see internet explorer popups, for this I open vCOPs directly in the web browser. As of now I haven’t found any issues, mostly I have deployed it for small infrastructures. There are sizing tools available for vCOPs (some excellent posts by Sunny Dua and Prasanjit Sarkar), I recommend that you have a look. 8/10, however sometimes you have to figure out where the exact problem is because you know your infrastructure better than technical support as you know what the ins and outs of your infrastructure are and they don't. I have used Nagios, and ICINGA, but after monitoring through them I strongly feel they are only meant for monitoring physical server. It is easy, but for best practice go through the VMware official documents. I implemented it. Initially I did a POC by reading VMware documents and blogs. It helped me to double my consolidation ratio and increased density of VMs per host. I looked at VeeamOne, SolarWinds Virtualization Management, and I found that both are the best software to use. VCOPs is one of the best products from VMware. It uses internal algorithms to calculate data. Let it collect some data over a period, I would suggest at least one week. Then start real monitoring. VCOPs can pull data from storage as well, you will have configure adapter. Another thing Custom dashboard is somewhat hidden, I have seen many people use VCOPs but they are not aware of it. 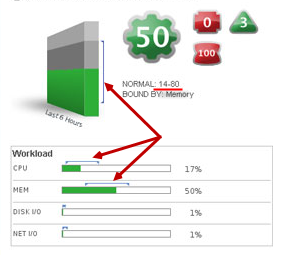 As in the screenshot this is small tip for beginners, I have pointed out the brackets, they are the dynamic threshold set by vCOPs, anything going above that range, means you have to look into it, also on the box if you see above the Green bar there is a grey color stacked line that is also a dynamic threshold., above that workload is increased.